Jim Taylor’s mom used to joke that he would grow up to be a singing chef. With his latest endeavor, Taylor is on his way. After a dozen years as a choir teacher at McNary High School, Taylor now teaches food classes at Claggett Creek Middle. “I did all my singing first, now I’m a chef,” said Taylor, who came to Claggett Creek last year to provide more elective opportunities for students. After teaching video production, drama and foods for a school year, Taylor now teaches a full load of food classes. Food is a passion of Taylor’s, particularity growing it. Three years ago, he created a food forest at his home in Monmouth and last year pulled out 3,700 pounds of produce from his garden that includes 700 strawberry plants, 40 tomato plants and 16 6-foot blueberry bushes. Along with bringing much of the food to his 240 students to be used in the classroom, Taylor also reached out to his friends and brought in 700 pounds of pumpkins this fall from one farm and 1,600 pounds of apples from another. Students made 600 pounds of apple and green tomato relish. “I teach them how to pickle, how to freeze, how to can, how to process,” Taylor said. The natural next step was to teach the students how to grow, which meant Claggett needed its own garden. 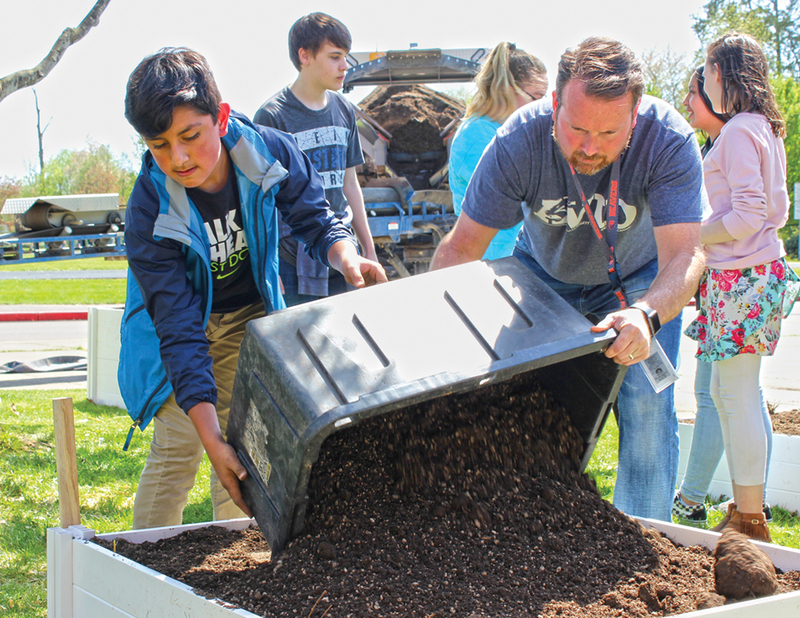 “Day dreaming with the administration, it took off,” said Taylor, after more than 100 students spent Monday, April 23 planting fruit trees and strawberries. Highway Fuel provided a truckload of dirt. The garden includes twenty-four trees, purchased at cost from Scenic Hill Nursery in Albany. Nearly 30 Claggett families got the same deal, planting fruit trees at their own homes. Also in the school garden are 800 strawberry plants, 60 blueberry plants, peppers, lettuce, tomatoes and onions. Much of the work was done by Taylor’s family, foods and culture class, where students learn how families can grow their own food, whether they live in an apartment or on five acres and everything in between. The class went to Mt. Angel Meat Company to see how meat gets to their table as well as Fessler Nursery in Woodburn. Along with family, foods and culture, Taylor also teaches a six-week course where sixth graders learn how to cook breakfast, an 18-week course where seventh and eighth graders cook breakfast, lunch and dinner, and a year-long advanced foods class full of students who want to explore culinary arts in high school or even want to pursue a career in the industry.